We designed a selection process that is fair, open, and transparent and issued an open call for proposals that articulate both a problem and its solution. 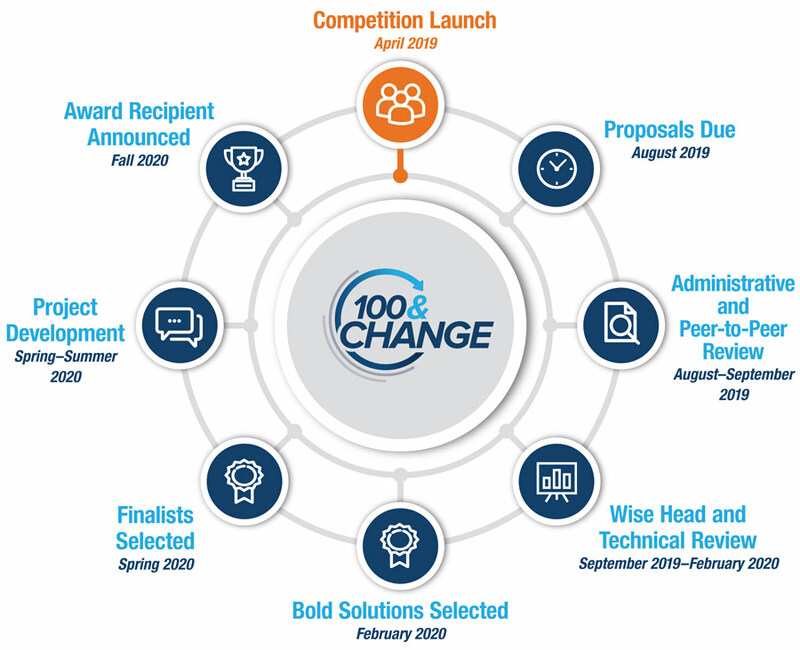 Once the application period closes, MacArthur staff will work to review each 100&Change submission to ensure it meets the requirements and rules before advancing to the next stage. During the peer-to-peer review process, applicants within the same domain will score and provide feedback to each other’s proposals using our established criteria. Our “wise head” panel of external judges will then review and score submissions using the same criteria and trait scoring rubric. Based on those reviews, top scoring applicants will receive domain-specific technical reviews in which proposals will be assigned to a technical reviewer with expertise in the field of the proposed project. We will seek to generate increased recognition and support for high-impact ideas designated as “Bold Solutions,” by featuring them in our online database of the strongest proposals. MacArthur's Board of Directors will then select up to ten finalists. Over the next several months, the finalists will work with an expert team to strengthen their proposals, present a preliminary plan for monitoring and evaluation and learning, and show authentic engagement with communities of interest before submitting revised project plans. Selection of the final award recipient rests with MacArthur’s Board. View the graphic or text below for details on the 100&Change competition cycle which repeats every three years.